"These two are different. You mark my words." Those wacky Papin girls are back! This made-for-British-television film tells the story of Christine and Lea, sisters in service responsible for one of the more grisly and notorious crimes of the early part of the twentieth century. Jean Genet made their case the subject of his play The Maids, and dedicated dOc readers may remember that the gals took center stage again in Murderous Maids, produced in the Papins' home country, France, in 2000. (Can you fathom my pride, dear reader, in being dOc's go-to guy for French incestuous lesbian homicidal chambermaid movies?) The facts of the case have an undeniable allure—we're in the same territory here as Jack the Ripper and Lizzie Borden—but this particular incarnation of the Papins' tale isn't especially successful. France, 1932: Christine Papin (Joely Richardson) works chez Danzard, where she is soon joined in service by Lea (Jodhi May), her younger sister, in what is, temporarily, anyway, a joyous reunion. 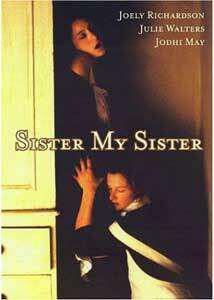 This movie is about the relationship between the sisters, as well as between them and the women whom they serve: the imperious Madame Danzard (Julie Walters) and her frumpy daughter, Isabelle (Sophie Thursfield). Unfortunately, much of the power of the tale is undercut by the filmmakers' storytelling strategies—basically, this is a movie that never gets out of the house. These four are just about the only people we see, and every scene of any significance takes place within the Danzard residence, which makes for a cinematic claustrophobia that isn't rewarded by the intensity of the relationships. In some respects, it's taken all of the worst aspects of a stage play without any of its virtues—that is, we're told things instead of shown them; and there's tremendous chatter about off-screen characters whom we'll never meet. Christine and Lea, for instance, have their differences about Maman, a principal topic of conversation—is she benevolent? Selfish? A monster? Chatter from the girls in their bedroom won't shed much light on this, and the dialogue that the actors are given doesn't help them much, either. The four women are game, though, that's for sure, but their material isn't up to the task. There are intimations of sexual attraction between the help and the employers, aside from the sexual liaisons that have made the Papins infamous, but it's all so layered over with propriety and stiffness that there just isn't all that much to watch here. It's a movie with lots of voyeurism, of servants spying on masters, and vice versa; but the peeping Tom aspects don't get you very far, either. (And a bloody prologue telegraphs the ending of the film, for those who may not already know Christine and Lea's story.) The unearned hysteria of the second half of the movie especially make this an off-putting exercise, even if you're intrigued with the story or the talent involved in the production. There are also lots of portentous extreme close-ups of dripping sinks, for reasons I do not understand. I will not rest easy, however, until the Olsen twins favor us with their own version of the Lapin story. Everybody's got to have a dream. Image Transfer Review: This is a muddy, dark transfer, with badly faded colors and many scratches. The print probably didn't look that good to begin with, but it's been badly beaten up coming over to DVD. Audio Transfer Review: The sound is occasionally oddly muffled, and the 5.1 track is particularly problematic here. Though it's lower tech, the 2.0 track may be the way to go, though it too has its share of hiss and crackle. Extras Review: Brief bios are provided for Richardson, Walters, May and Thursfield; you'll also find a link to the website of the DVD's distributor, Koch Lorber. Basically, this is a pretty shoddy soap opera, with obvious writing and generalized emoting. Even if you're intrigued with the historical circumstance, you won't find much illumination here.